As we all know that iPhone is not waterproof. So you dropped your iPhone in the bath, the sea or the toilet, and you want to fix it, dry it out, and the most important is to recover the data inside. In this article, we show you how to fix the water-damaged iPhone and recover date from water damaged iPhone(iPhone 6s Plus/6s/6 Plus/6/5s/4s/4) in an easy way. First things first. Get the iPhone out of the water (lake/bidet/soup) right away, if you haven't already, and don't even think about plugging it in. If the waterlogged iPhone is plugged in already, unplug it (very carefully), and don't be tempted to turn it on and check for damage, which can cause short circuits. If the wet iPhone is in a case, remove it; take the SIM card out too. (Removing the battery wouldn't hurt either, but this is obviously only for confident DIY-type users who are willing to void the warranty.) These steps help to reduce the number of nooks and crannies where water can linger, and help to avoid damage to key iPhone components. Then dry it. Don't try to dry your water damaged iPhone with a hair dryer or other external drying machine. This can force water deeper into your iPhone. You can choose to put it in a container of uncooked rice for a few days to dry it, or take it to the repair store. When the iPhone gets dry, you can try to turn it on. 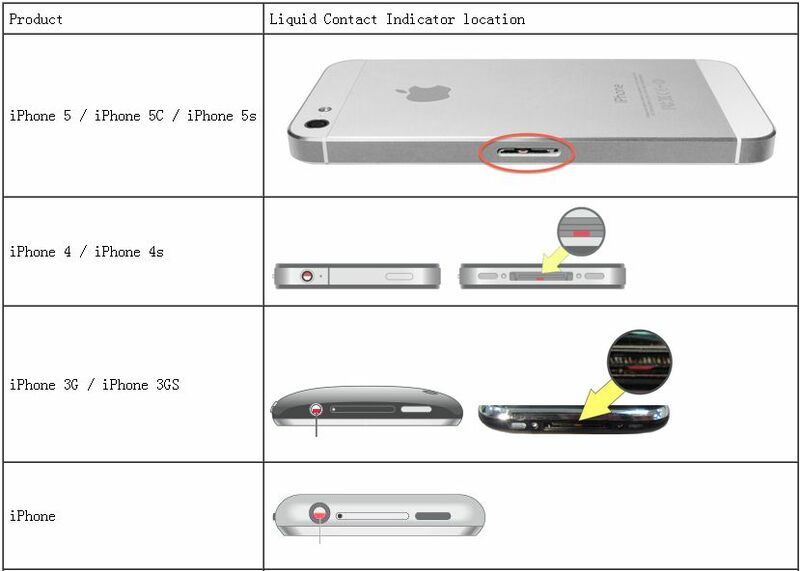 Some users get the Apple logo after turning the device on, and they can't get the iPhone connected to computer via the USB cable. If this happens, you will not be able to get the data on it with the worst result. If you want to retrieve data from water damaged iPhone, you can retrieve the data from the backup in iTunes. 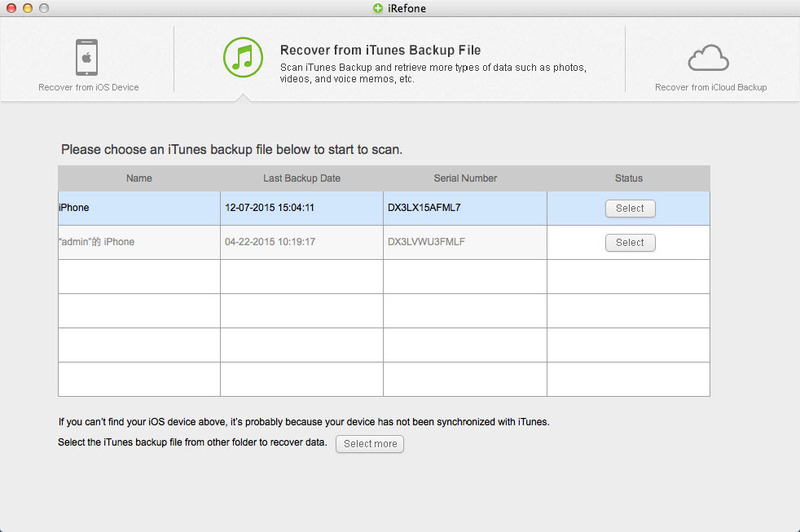 The iTunes backup can be used for restoring your new iPhone, but if you want to view and manage the contents in the backup, we suggest you make use of third party iPhone data recovery software- iRefone for Mac. This software is used for recovering lost files from iTunes, iCloud backup and iOS devices. 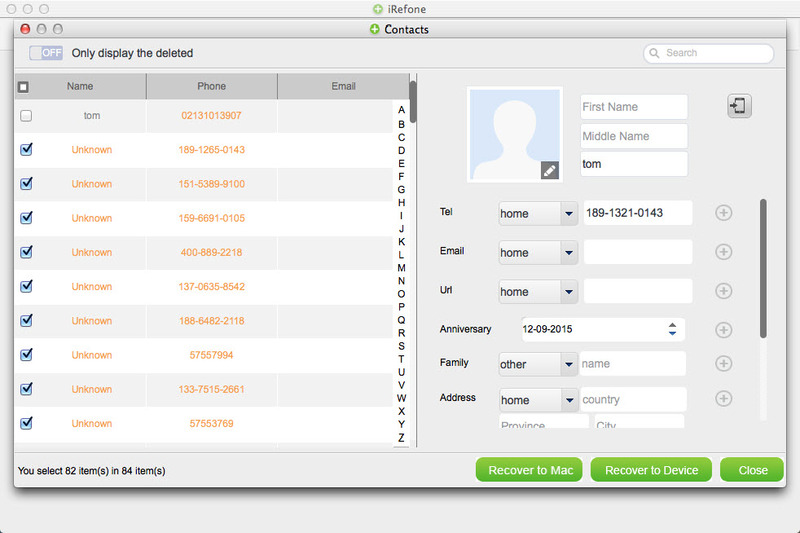 With iRefone, you can recover data from water-damaged iPhone directly. If you are able to turn the iPhone on and connect it with the computer, you can recover data from this water-damaged iPhone. After recovering data from water-damaged iPhone, you can change a new one without any worries. If your water damaged iPhone can't be open, you can also use iRefone to extract and recover data from iTunes or iCloud backup file. This program you can easily recover your messages, contacts, call history, voice memos, calendar, notes, reminders and even Safari bookmarks and more. Its equivalent Windows version is iRefone. The following guidance will show you how to recover data from water-damaged iPhone, and you are allowed to free download the software. Note that the trial version stops at the preview window. Step 1. 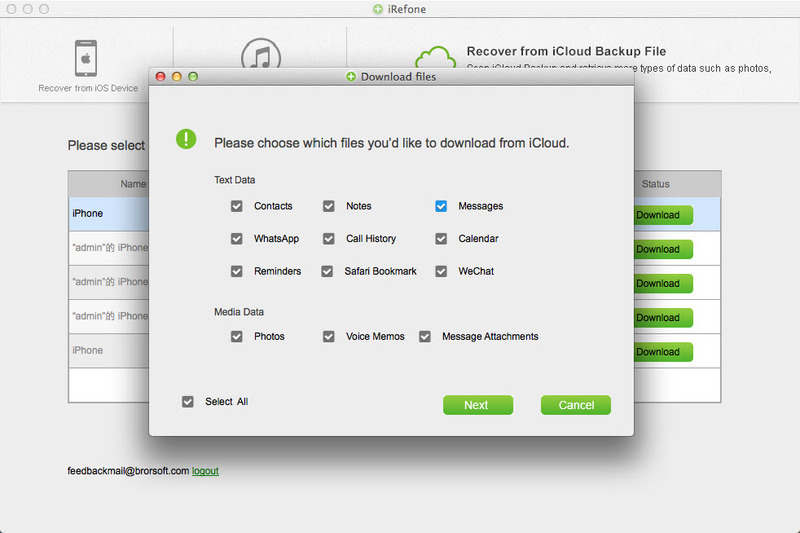 Choose "Recover from iTunes Backup Files" after launching iRefone for Mac. Then you will be presented with an interface listing all the iTunes backup files. Choose one from which you wan to recover your lost data. 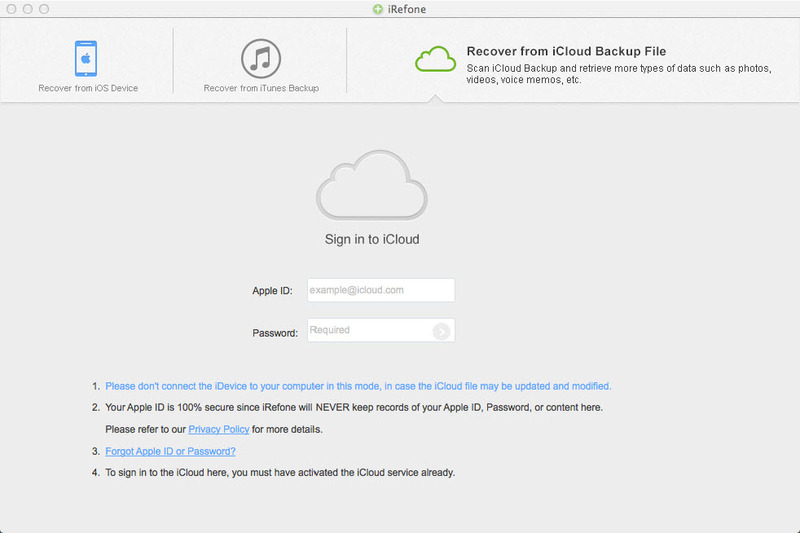 After launching iRefone for Mac, choose "Recover from iCloud Backup", then sign in with your Apple ID and password. Bear in mind that, you must have activated the iCloud feature before you sign in. After signing in, you need to choose one file contained your lost data to download and then, you will enter the data interface. Just choose the data you need to scan. After scanning, you can preview and select your lost data including photos, contacts, call history, messages, voice memos, notes, etc to recover from your damaged iPhone. You're done. 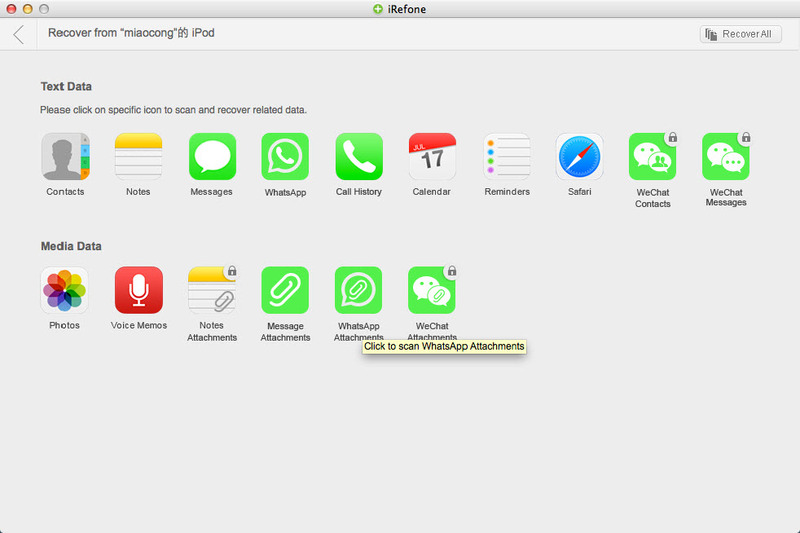 As you see, iRefone is the best program that will help you recover most of the important data from your iPhone, and it will save the data onto your computer so that you are able to view and manage them.